As debates swirl around science-related issues ranging from climate change to the food we eat, an important question is where Americans go to stay informed about science topics, if anywhere. A Pew Research Center survey conducted in May and June finds that general news outlets – those that cover a variety of topics in a given day – play a large role in how Americans stay informed about science. 1A majority of Americans get their science news from general outlets, though many question how often these outlets get the science facts right. 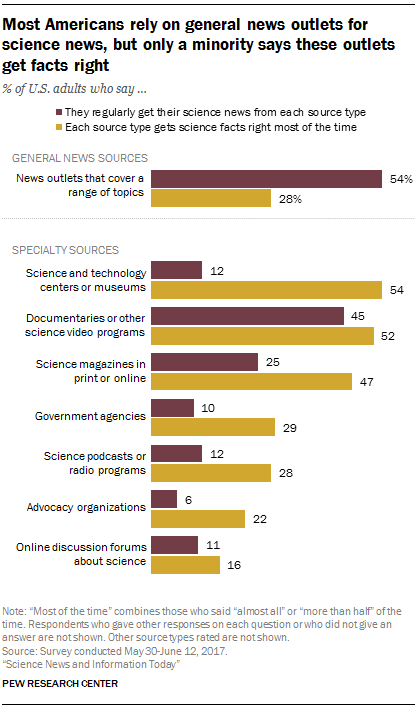 More than half (54%) say they regularly get their science news from general news outlets, outpacing every other source type asked about, including a range of specialty science sources. But just 28% of U.S. adults say general news outlets get the facts right about science almost always or more than half of the time. By contrast, roughly half of Americans say specialty sources – specifically, science documentaries, science magazines or science museums – get the facts right most of the time. 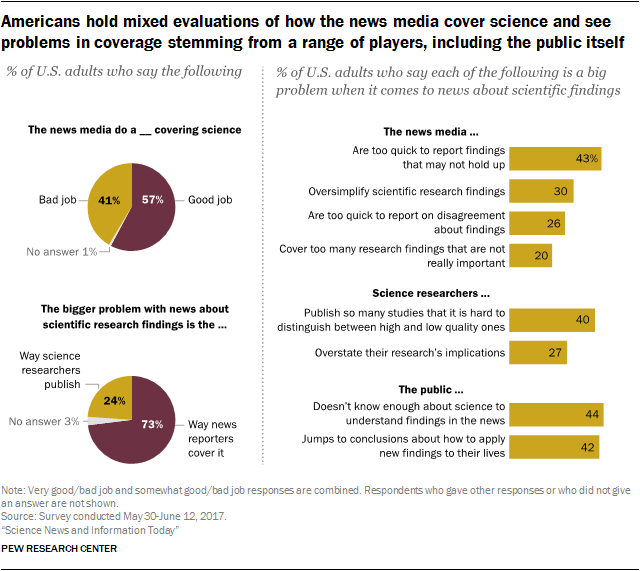 2On balance, most Americans (57%) say that the news media do a good job covering science, but people also see problems in coverage stemming from the news media, researchers and the public itself. For example, 43% of Americans say it is a big problem that the news media are too quick to report findings that may not hold up. A similar share also see problems stemming from researchers publishing so many studies that it is hard to tell high from low quality (40% say this is a big problem). When pressed to choose which problem is greater, almost three-quarters of Americans (73%) say that the bigger problem lies with the way the news media cover scientific research, whereas just about a quarter (24%) say the bigger problem is the way researchers publish and share their findings. At the same time, roughly four-in-ten U.S. adults say the public not knowing enough about science (44%) and jumping to conclusions about how to apply research findings to their lives (42%) are big problems in coverage of research findings. 3 Twice as many social media users distrust science posts on these platforms as trust them. Social media play a modest role in how Americans stay informed about science. Most social media users report that they occasionally see posts related to science on these sites, though fewer see either “a lot” or “some” science posts there. All told, 44% of social media users report they at least sometimes see science news on these sites they would not have encountered elsewhere. 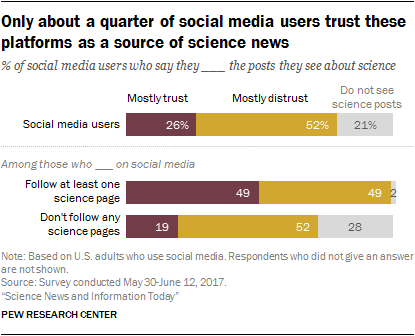 But, users tend to view science posts on social media sites with a skeptical eye; far more say they mostly distrust than trust what they see about science on these sites by a margin of 52% to 26%. About a quarter of social media users – 26% – say they follow science pages or accounts. These users are more likely to consider social media an important source of their science news and are evenly divided over whether they mostly trust or distrust the science posts they see (49% to 49%). 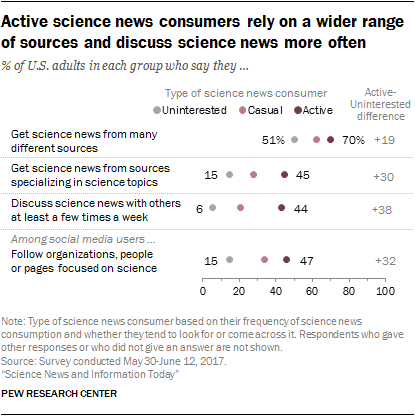 4 The 17% of U.S. adults who are active science news consumers cite their curiosity as a key reason, and they rely on an array of science news sources. About one-in-six U.S. adults (17%) are active science news consumers, getting science news at least a few times a week and mostly seeking it out. Another 49% are “uninterested” consumers who get science news infrequently and tend to happen across it. Among active science news consumers, nearly all (97%) say curiosity about what’s happening in science is a reason they follow such news, with 77% saying it’s a major reason. These active consumers turn to more types of science news providers and are more likely to discuss science news with others. Those on social media are also more likely to follow science pages or accounts, thereby bringing more science information into their social media feeds. 5Family and friends play a relatively modest role in how Americans get and share science news. A third of Americans (33%) say they regularly get their science news from family and friends, and just 17% have discussions with others about science news at least a few times a week – far lower than shares who talk about news in general or politics in particular. And when people think about the accuracy of information sources about science, fewer say their family and friends get the science facts right most of the time (16%) than say the same about either general news outlets (28%) or a range of specialty outlets such as science museums (54%), science documentaries (52%) or science magazines (47%).